Admaya CPC and PPC Ad Network Adsense Alternative – How To make Money Online ? 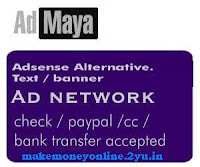 Today I am Sharing a New Adsense Alternative advertising Network Known as Admaya. I Think iam One of the very oldest Ad Publisher in Admaya. My id is : 160 . Today more than 25,000 thousand publisher in Admaya network. Admaya is Good Way to Monetize your Blog or Website. It is Good Adsense alternative Website. Admaya is a Pay Per Click (ppc) and Cost per click (cpc) advertising Network. Admaya mainly target’s the Indian Ad Publishers and Advertisers, But operations are worldwide. They have a huge collection of advertisements from various Clients world wide. Admaya.in provides many Sizes of Ads Both Text and banner’s, They Also provide Sticky Ad type Means you can place floating ads too in your website. If you are Interested to join Admaya then The approval of your account does not take much time. Your account will be approved in just 3 days maximum. Once your account Approved Admaya will allows you to copy the code to as many websites or blogs you own. Means you can place ads on any website except Adult websites. Admaya is Advertising Network. If you Searching for Cheaper and Quality Advertising Network then Admaya is Best for you. Advertising Rates are Very Low : $0.025 per click . When you join’s the Admaya you will get $5 free Bonus advertisng Pack.